ASHBURN, Va. (AP) — Home sweet home? Not so much for Redskins players right now. Even though Washington has won three of five home games this season and leads the NFC East, cornerback Josh Norman called out Redskins fans in the aftermath of an ugly victory at Tampa Bay and said he felt they played better on the road. In the process, he put the spotlight on the atmosphere Sunday at FedEx Field when the AFC South-leading Houston Texans come to town. Norman said home games are “like the other team’s turf” because of an infusion of opposing fans and opined that Redskins fans “just boo everything and aren’t really behind us.” Teammates hope that sentiment works to provide a spark of energy for the rest of the year. The Redskins organization began a concerted effort in the offseason to try to improve the fan experience at the stadium in suburban Maryland. Aware a sellout streak the team boasted had lasted the past 50 seasons would end, the decision was made to stop selling as many tickets to brokers and try to draw back in some of the disillusioned fans of a franchise that has just three playoff victories since its last Super Bowl title from the 1991 season. 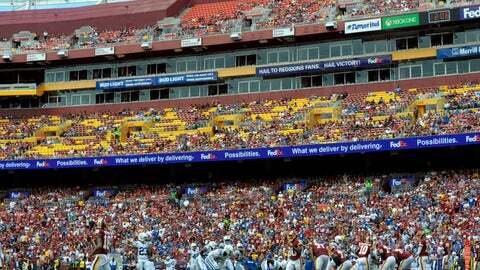 Washington’s average attendance of 61,201 ranks 26th in the NFL, and its 74.6 percent-of-capacity crowd ranks dead last. Chief marketing officer Steve Ziff said prior to the season there’s no timeline for when he expects fans to return in droves like the glory days at RFK Stadium. Right now, the Redskins are winning. At 6-3, they’re two games up in the division and on pace for their first postseason appearance since 2015. But Thompson, who has been with the team since 2013, understands there are long-term issues under the surface leading to fans staying away. Decades of mediocre on-field performance, polarizing opinions about owner Dan Snyder and the location of FedEx Field are all factors that have nothing to do with the current roster and its wins and losses. If the Redskins win the division and host a playoff game, the stands will be rocking like the old days — especially if Kirk Cousins and the Minnesota Vikings are the opponent. But to get there, they could use a boost at home so players don’t feel like they’re in unfriendly confines. For quarterback Alex Smith, it’s all about the cadence and ability to communicate verbally. On defense, it’s the opposite. The Redskins are coming off allowing 501 yards but only three points to the Buccaneers, and they’re counting on noise against DeShaun Watson and the Texans, who have won six in a row since an 0-3 start. NOTES: Coach Jay Gruden said left tackle Trent Williams (thumb) won’t play Sunday and there’s a good chance Thompson (ribs) is out, too. … In addition to Williams and Thompson, WR Jamison Crowder (ankle), CB Quinton Dunbar (shin), S Montae Nicholson (illness) and K Dustin Hopkins (groin) did not practice. Gruden said the team would see how Hopkins is Friday before deciding whether to sign another kicker. … With Crowder still on the mend, rookie WR Trey Quinn was activated off injured reserve and added to the active roster.